I had a great time in Tupelo, Mississippi yesterday. 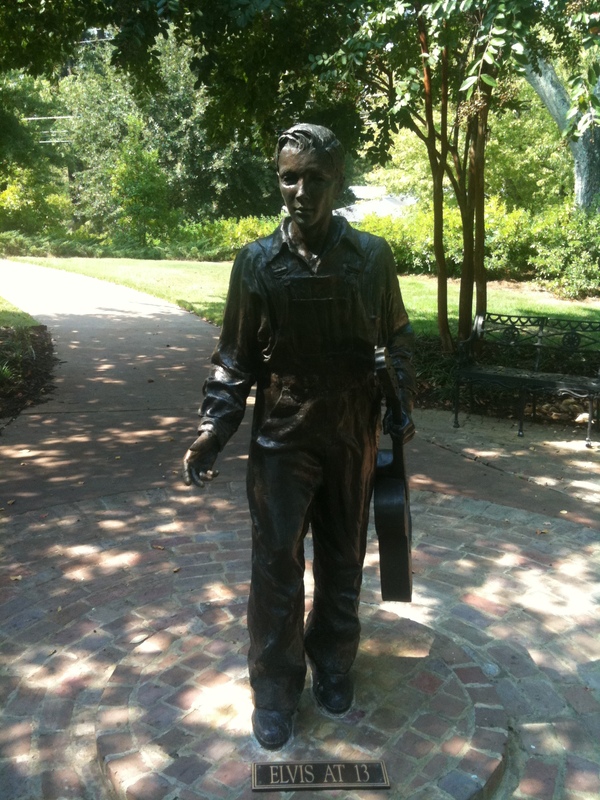 I had been to Tupelo twice before, but only to visit Elvis Presley’s birthplace. This is a great reason to visit Tupelo, but the city has a lot more to offer. I really fell in love with this small town that produced a King. I left Memphis just before 10am and started my 100 mile southeast to Tupelo along route 78. It is quite a pleasant drive, except for the annoying traffic between route 55 and route 78, but it is cool to see the FedEx planes taking off right above you. 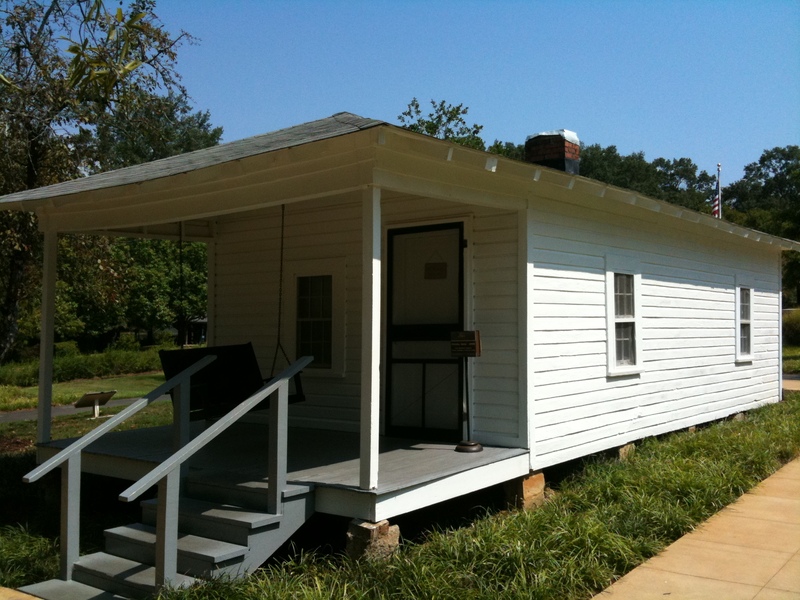 I arrived at Elvis Presley’s birthplace just after 11:30, paid my $12 and began exploring. There is the museum, the gift shop, the chapel, Elvis’ old church (the actual church) and the house where Elvis was born (the actual house!). It is all set up in a really nice, serene park-like setting. I started with the museum. 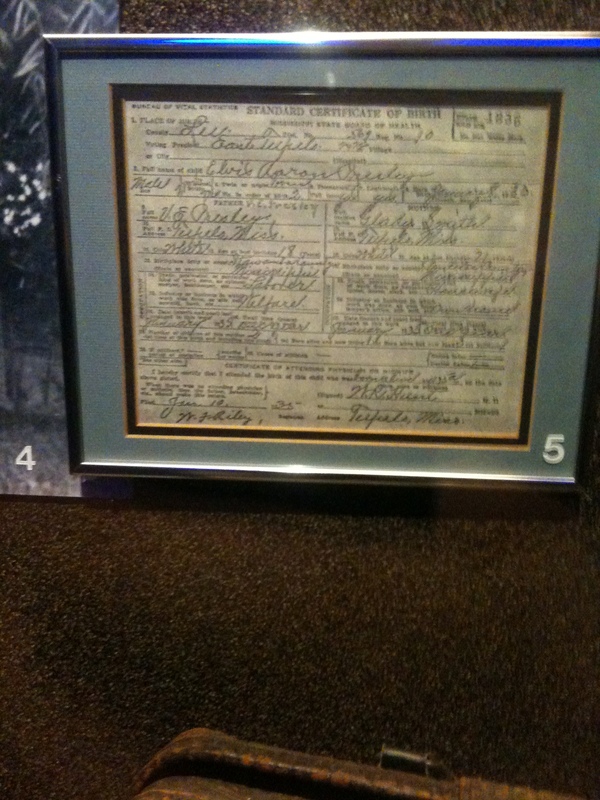 It is pretty cool because they have Elvis’ birth certificate as well as a lot family photos and things you have never seen at Graceland. 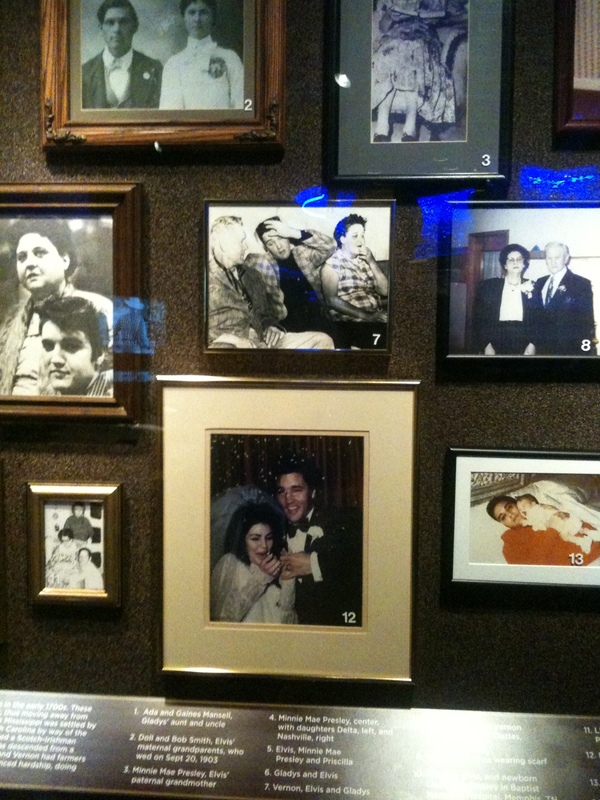 There are also 2 movies you can watch about Elvis and Tupelo. I was told there were 2 programs in the church at noon and at 1, so I thought I would catch the noon show. I went to the church, but the door was locked. I knocked, but no one was there. Oh well, I had seen the program before. They recreate what a church service would have been like for Elvis. 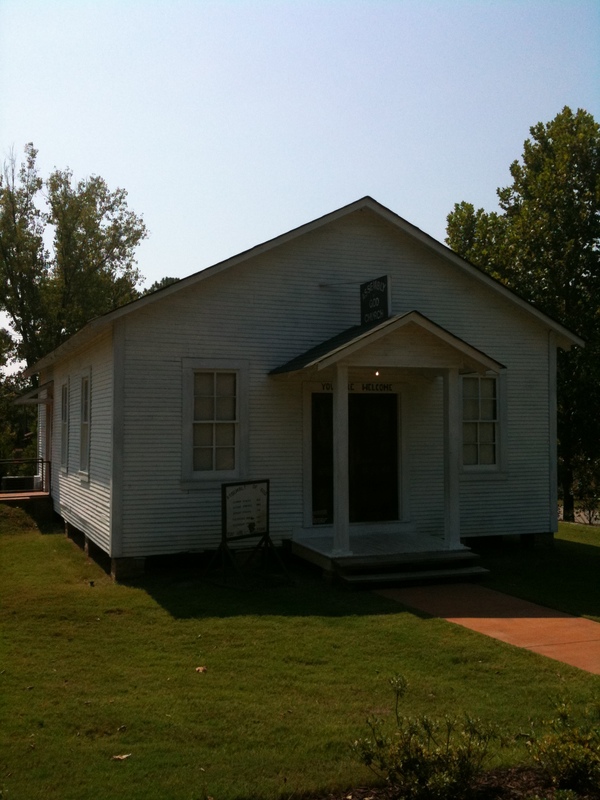 It is the actual Assembly of God church that Elvis attended as a young boy. 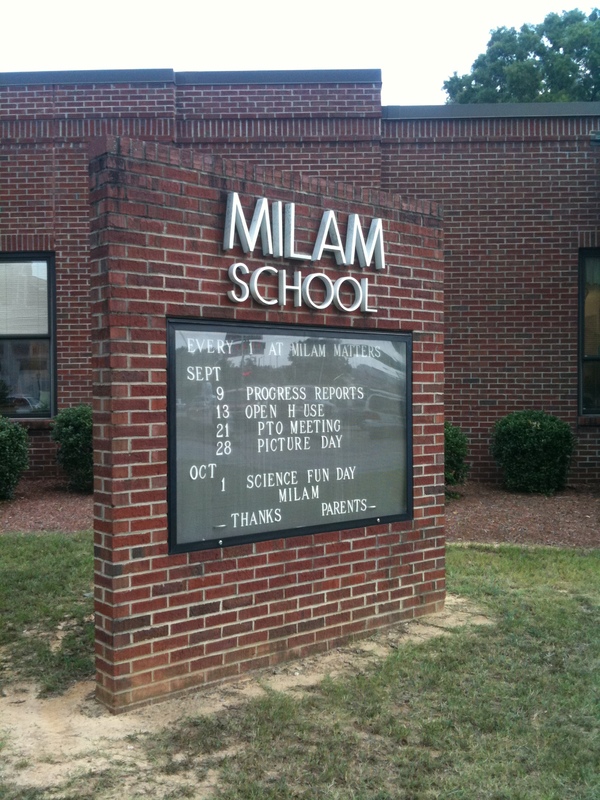 They moved it from its original location. 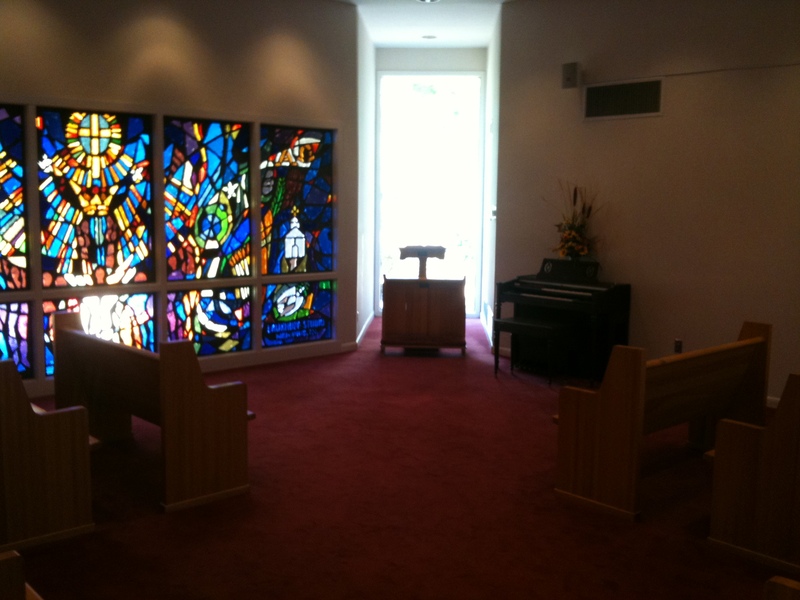 I then made my way into the Elvis memorial chapel, which was built in 1979. Elvis gospel music is playing, there are plaques and flowers and church pues with dedication plaques from friends and fans. 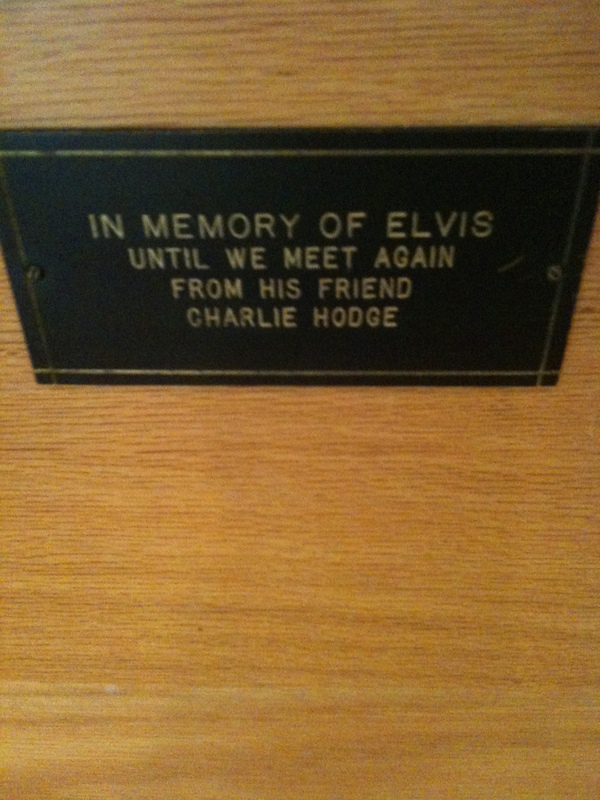 There was one from Charlie Hodge, who I was fortunate enough to meet before he died – such a funny guy! There was also one from Colonel Parker, but someone has scratched his name out. I walked to the Fountain of Life, which I do not remember seeing before. 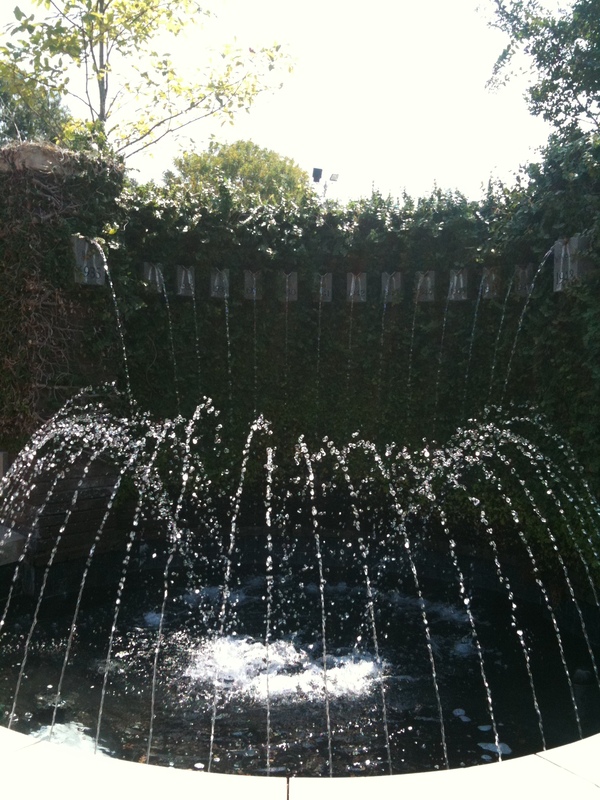 I really liked it – I think I just like things with water. 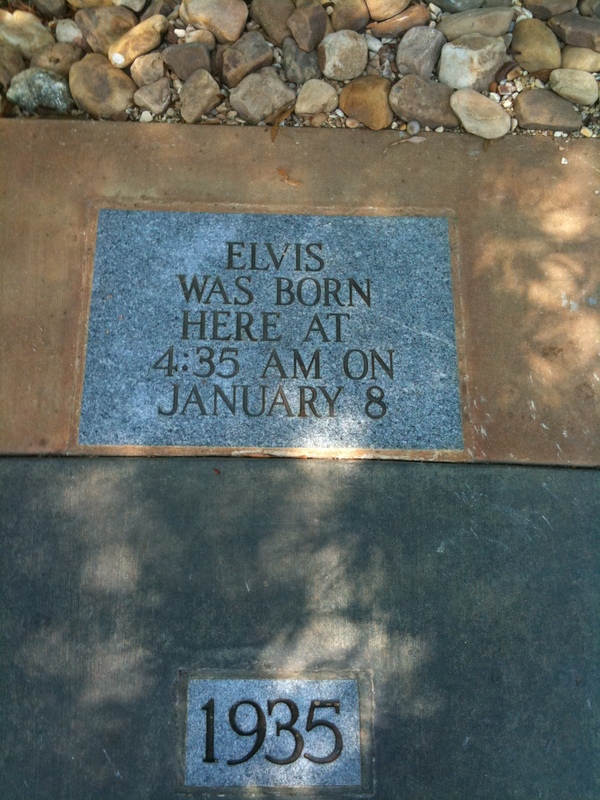 It is a fountain with plaques notating important years in Elvis’ life in Tupelo starting with his birth in 1935 and ending his move to Memphis in 1948. Then on the side, there is the 1977 Death plaque. 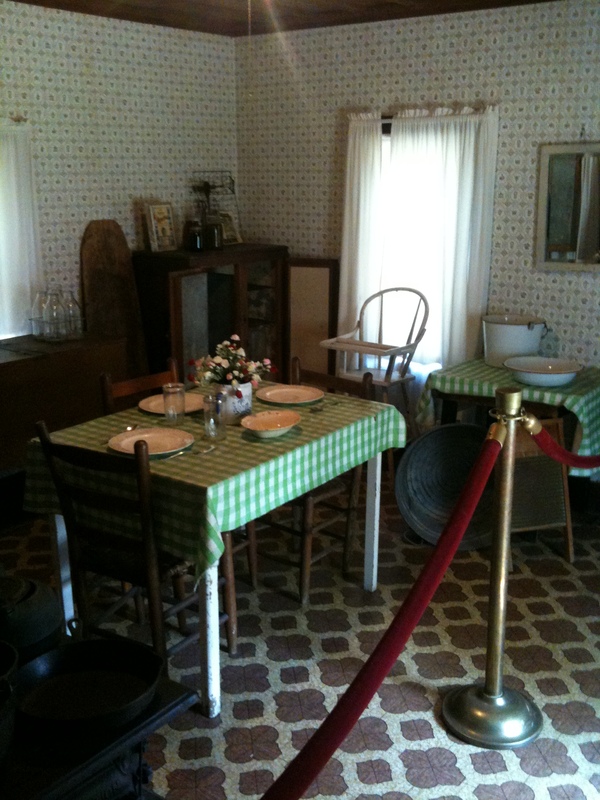 Then I went to the house where Elvis Presley was born on January 8, 1935. It is the actual house. 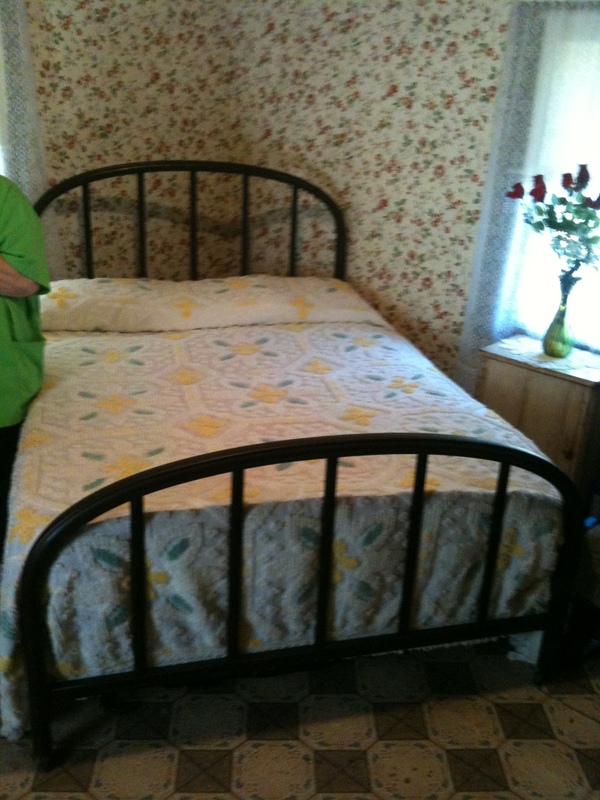 The furniture isn’t orginal, but Vernon told them were to place everything so it is just like it was when Elvis lived there. Elvis bought the house and gave it to the city. 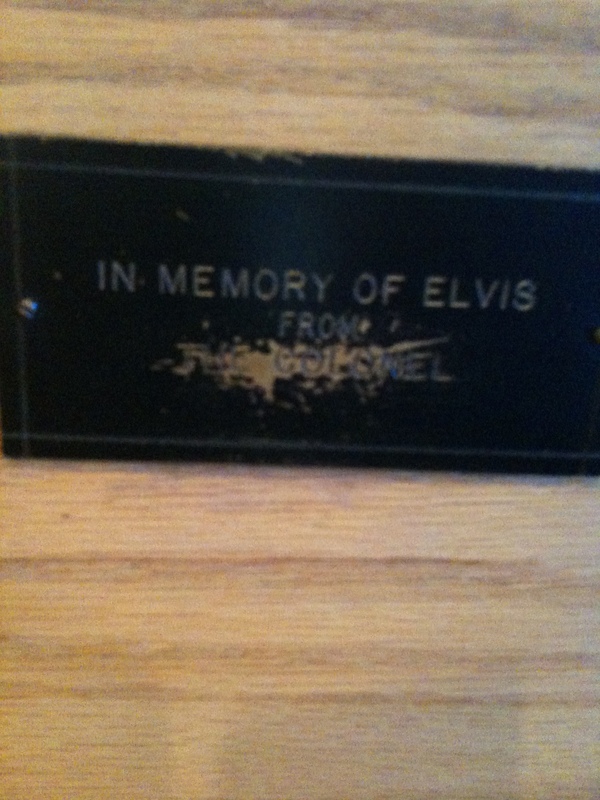 It is just an amazing feeling to stand in the same room where Elvis was born. It is a small 2 room house. They call it a shotgun house because you can fire a shot from the front door to the backdoor. There is just the bedroom and the kitchen. There was an outhouse up over the hill next to the barn. Vernon built the house. The last stop was the Presley’s Plymouth. 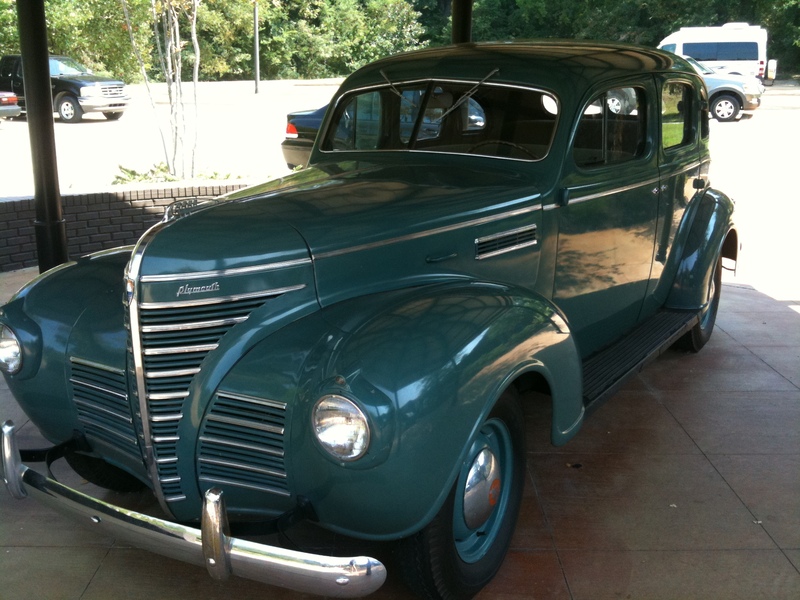 It is the car they moved to Memphis in 1948 when Elvis was 13 because Vernon could no longer find work in Tupelo. 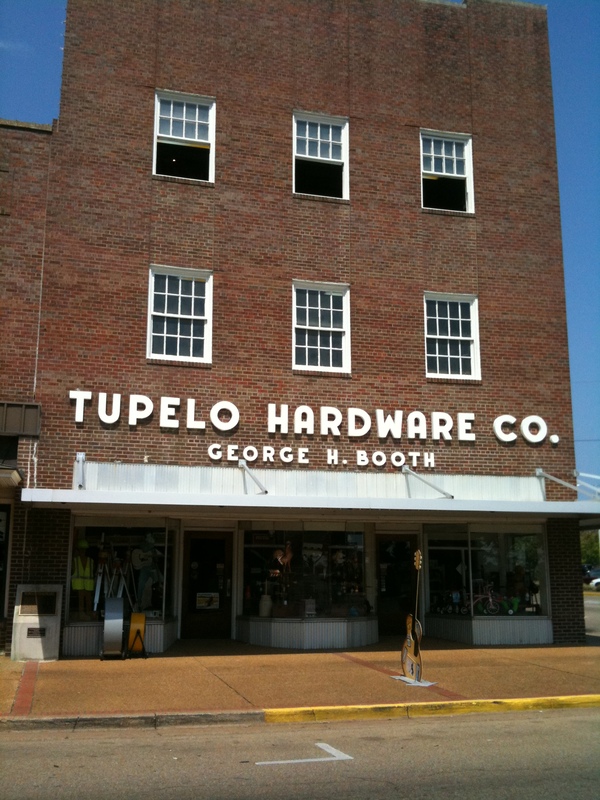 After leaving Elvis Presley’s birthplace, I wanted to visit the sites of downtown Tupelo and the Tupelo CVB twitter suggested Johnnie’s Drive-In, Tupelo Hardware and of course the CVB – all on Main Street. So I did that and more. 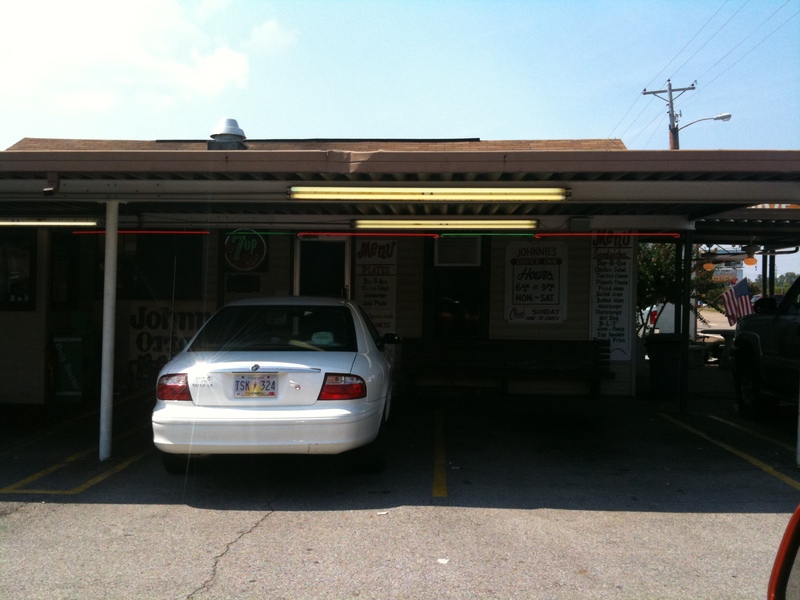 Johnnie’s Drive-In was great! An old-time drive-in restaurant. In fact, I pulled in and parked under the carport and had a knock on my window that startled me. It was the waitress, but I decided to eat inside instead. Johnnie’s had been there since 1945 and Elvis used to hang out there. The food was really good and really cheap. 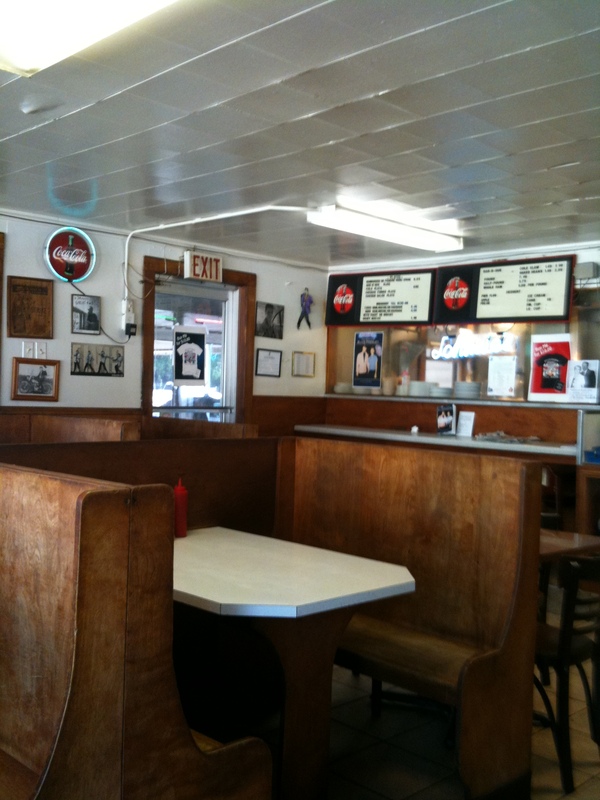 I had a pimento cheese sandwich, french fries and sweet tea for $5.50. 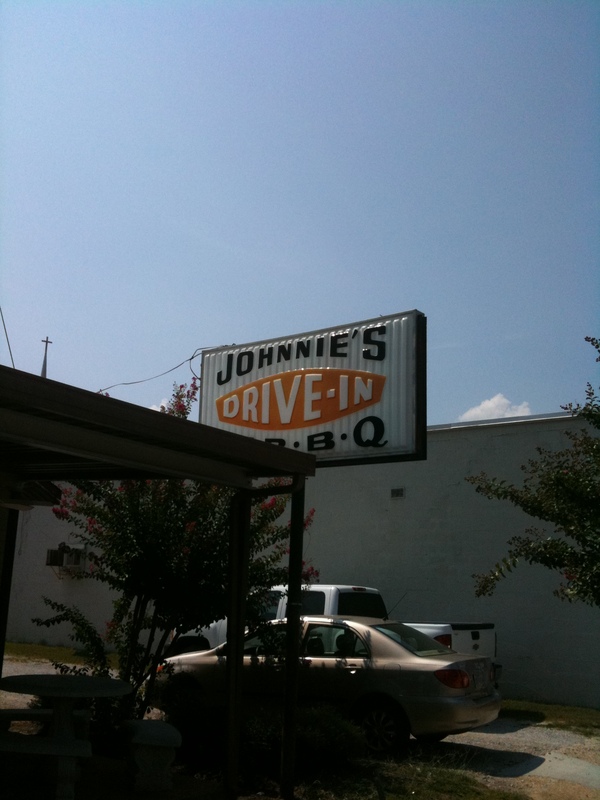 I will definitely eat at Johnnie’s when I’m back in Tupelo. 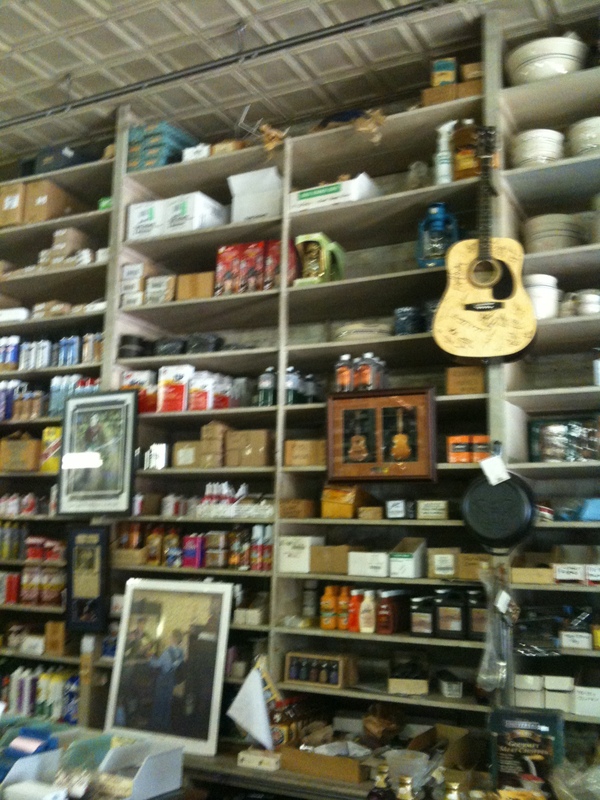 My next stop was Tupelo Hardware where Elvis bought his first guitar. The store is pretty much as it was back in the 1940s. 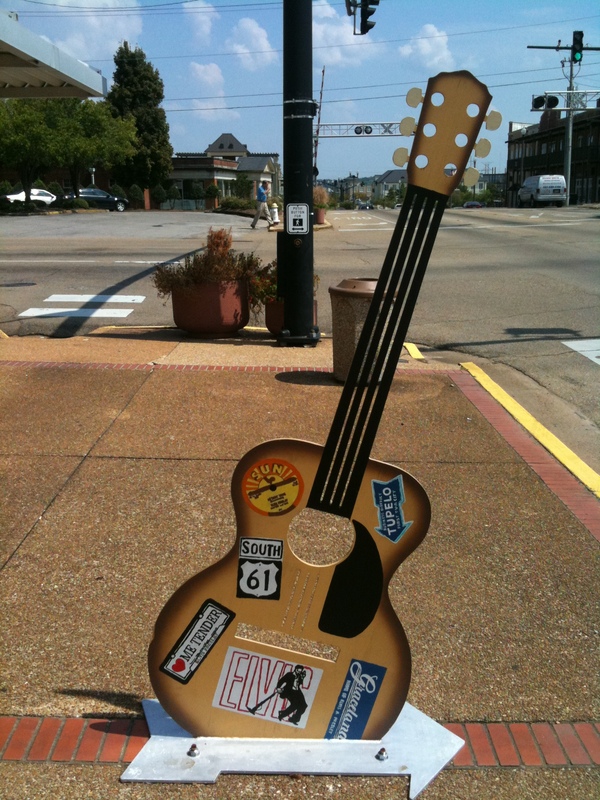 I drove up and down Main Street and noticed these great guitar sculptures painted with Elvis themes. The nice lady at the Tupelo CVB told me that they were painted by school children. 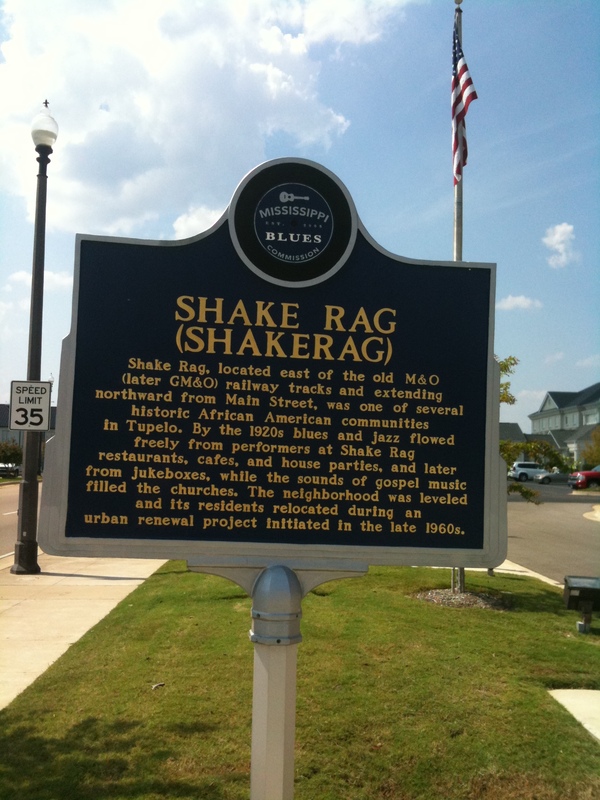 The Tupelo CVB is on the site of the orgingal Shake Rag. 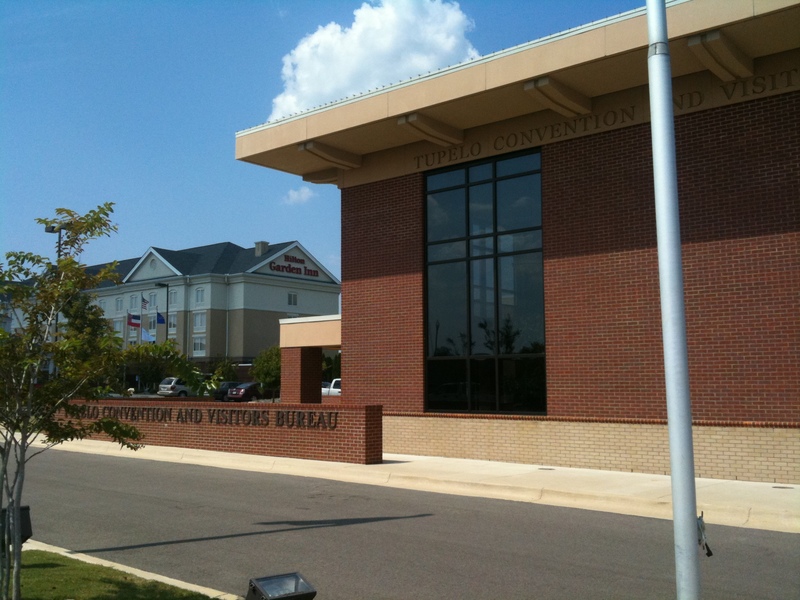 Also next to the Tupelo CVB is the BankcorpSouth Arena. I didn’t realize they had big name concerts in Tupelo, but now that’s another option to see bands. 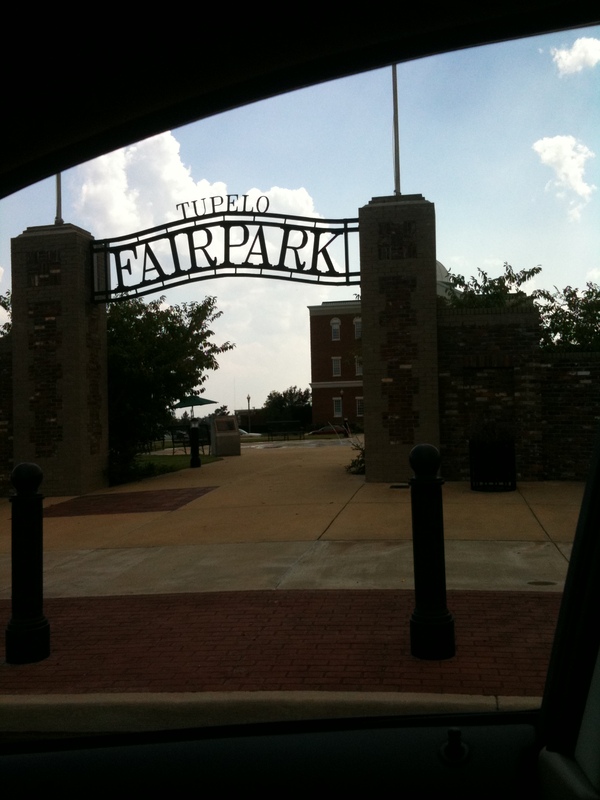 Across the street is the Tupelo Car Museum, which I did not visit on this trip but I will next time. I went down Main Street to the site of the old Fairgrounds where Elvis placed in the talent contest singing ‘Old Shep’ and returned in the 1950s for his Welcome Home concert. The site is now a park in front of City Hall, but the entrance to the fairgrounds is still there. My last stop in Tupelo was Elvis’ school. It must have been quite a walk from his house – at least a few miles. 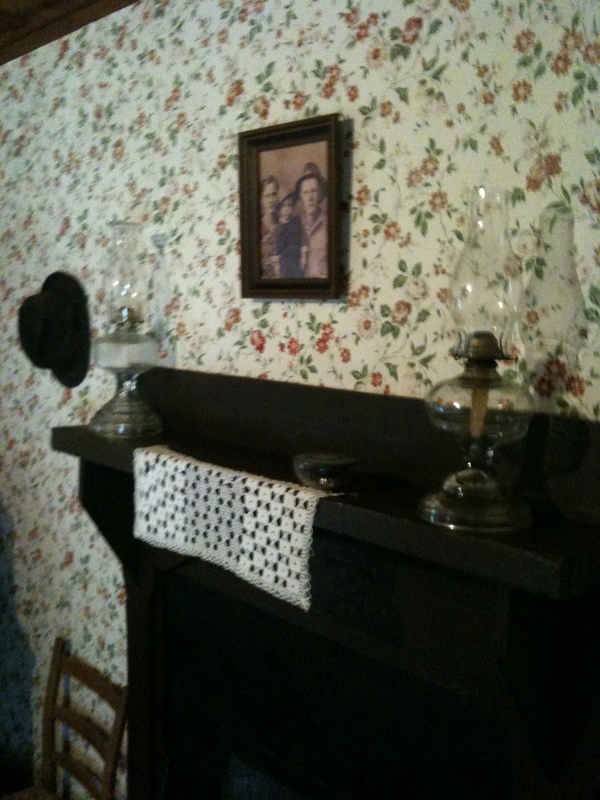 I really enjoyed Tupelo. The downtown Main Street area is great with shops and restaurants. 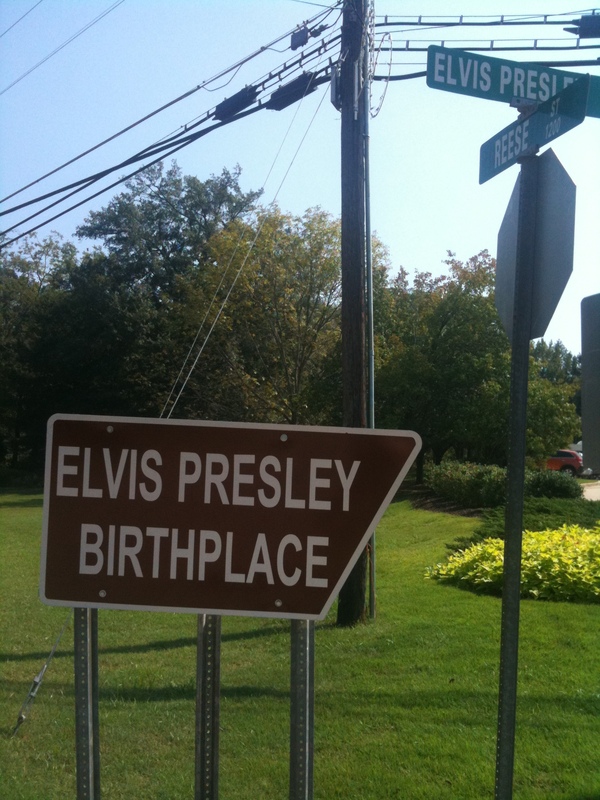 And of course I loved visiting Elvis’ birthplace. 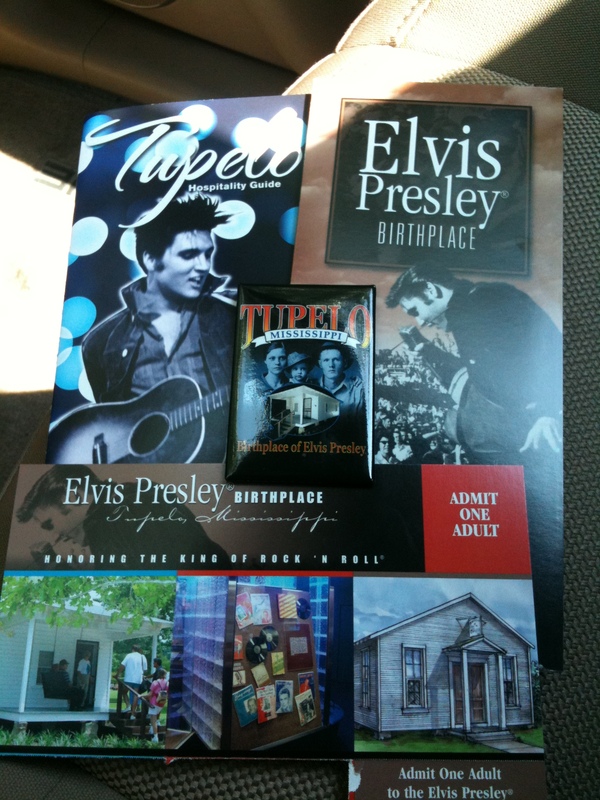 The whole day cost me less than $40 and that included gas, lunch, souvenir, touring Elvis’ birthplace and Tupelo. 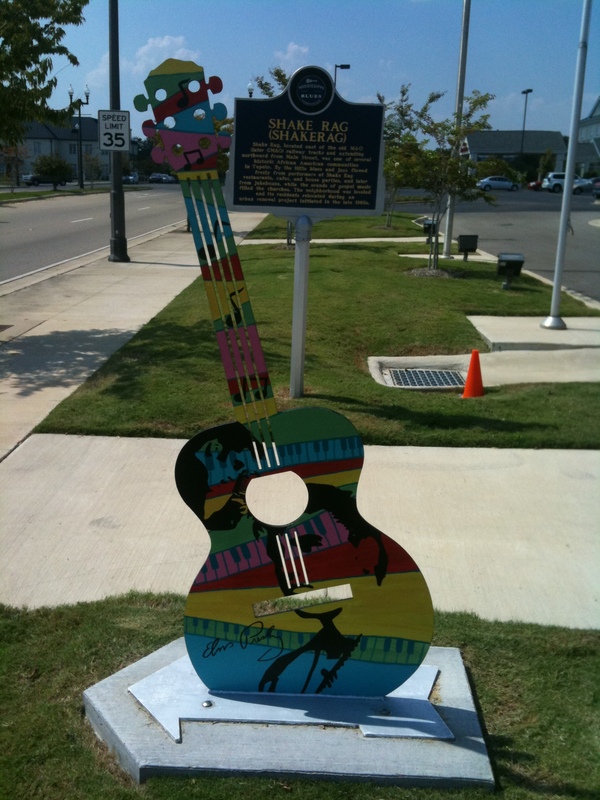 I will definitely be back to visit Tupelo – it’s more than just the city where Elvis was born.